Hearty and satisfying as a meal or as a side dish. 4-can Meat Chili - by Valerie B.
Asian Beef and Noodle Soup - by Betty. Avocado Refrigerator Soup - by Betty K.
Baked Potato Soup - by Cathy Lea. Black Bean Soup - by Virginia Hendley. Camper Kale Soup - by Cathy Lea. Camper Stew - by Nancy K.
Chicken and Avocado Soup - by Cathy Lea. Chicken and Ramen Noodle Soup - by Williamsburg Rally Attendees. Creamy Avocado Crabmeat Soup - by Betty K.
Creamy Corn Soup - by James Rose. Cuddle Mug Soup - by James Rose. Farmers Favorite Soup - by Cathy Lea. Garlic Soup - by Nancy. Green Chile Chowder - by Cathy Lea. Luscious Brie Soup - by Betty K.
Making Homemade Soup - by Cathy Lea. Mexican Bean Soup - by Virginia Hendley. Potato Chowder - by Virginia Hendley. Potato Soup - So Easy It Almost Makes Itself - by Chelle. Refried Bean Soup - by Cathy Lea. Rose Chili - by Rose and Rognar Doerwald. Sloppy Joe Stoup - by Cathy Lea. Smoked Salmon Chowder - by Cathy Lea. Taco Soup - by Cathy Lea. 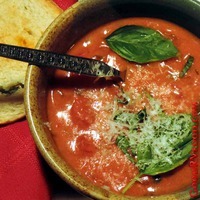 Tomato Basil Bisque - by Cathy Lea. Tortilla Soup from your Pantry - by Cathy Lea. Vegetable Beef Soup - by Cathy Lea. Wheat Chili - by Cathy Lea. White Bean Chili - by Dana Dykman.